Kent Christmas Tree Farms: choose-and-cut Christmas trees, Tree lots with pre-cut trees, stands, sleigh rides, hay rides and related winter events and fun! Whether you want to cut your own tree, pick a live tree and have it cut for you, buy a tree already cut or buy a living tree you can plant, this page provides detailed listings of Kent's choose-and-cut Christmas tree farms, places to buy pre-cut (also called pre-harvested and fresh-cut) trees, stands, sleigh rides, hay rides and related winter events and fun. Some listings are for tree farms, others are tree lots, and some only offer hay rides, sleigh rides or other winter events. READ EACH LISTING to know what each facility offers. The farms are listed further down this page, so scroll down the page! Since this service is free and open to ALL Christmas tree farms, not just those who belong to an association or pay for an ad, like almost all other websites do, this is the most complete and current listing available! I'm always looking for more to add, and to correct any inaccuracies or errors, so if you encounter any, please email me! And please tell the farmer you visit in Kent that you found their farm here! I need the farmers to realize that you found them here so that they will keep their information up to date! Park Lane Goudhurst, Cranbrook, Kent. Phone: 01580 211 044. John Stafford. Open: Sales centres open from 10 am to 3 pm, from 30 November to 2 December and 7 December to 19 December 2018. 2018 prices start at £35. Costs vary depending on the size and species of tree you choose! Get free vehicle admission for the day, a mince pie and 10% discount at the shop with every Christmas Tree bought. Buy your real Christmas tree from Bedgebury Pinetum this year for a wonderful experience and the highest quality, sustainably-grown British Christmas trees. Our expert staff can help you choose between Nordmann fir or Norway spruce, in a variety of different sizes and shapes. Free admission for one vehicle per tree purchased on the day of purchase only. Marshmallow toasting and s’more making at the fire pit. Our Waterfront Café will be open serving hot food, sandwiches, delicious snacks, cakes and drinks all with the festive season in mind. Our Boat House Bistro will be open for those who would like to enjoy a leisurely lunch with family and friends during their visit. The Bistro will be serving a delicious range of starters, light bites, mains, and desserts, including plenty of classics such as gastro burgers and steaks that always hit the spot. To make a reservation email info@belwater.co.uk or call 01892 893930. Cudham Road, Downe Village, London Borough of Bromley, Kent, England BR6 7LF United Kingdom. Phone: 01689 861603. Email: info@xmastreefarm.co.uk. Open: 10 am to 3 pm; Santa's grotto is open every weekend in December from 11 am to 3 pm. Please ring before traveling to check that Santa has arrived from the North Pole on the day of your visit! Nordman Firs. Free local delivery. The animals are still available to see and feed! Click here for a link to our Facebook page. Little Court Lodge Farm, Tonbridge Road, Teston near Maidstone. Phone: 01622 813950. Directions: On the A26 (Tunbridge to Maidstone Road) in Teston close to the Teston Country Park. The farm shop also has raspberries, apple, plums, sweetcorn, runnerbeans, blackberries. Locally produced fruit and vegetables, free range eggs, pure fruit juice, cakes, sweet pies, preserves, confectionery and Christmas Trees. Facilities: Ample parking, nearby pub, easy access for disabled, Halloween and Christmas promotions, opposite Teston Country Park. Castle Road, Saltwood, Hythe, Kent CT21 4EH. Phone: 01303 260163. You can pick you own Christmas tree in December (although we will dig it up for you)! Rowan House Farm, Kingswood, Maidstone, Kent. Phone: 01622 842 096. Email: info@kingswoodchristmastrees.co.uk. Open: From Saturday 10th of November, 7 days a week 9 am to 5 pm, until 7pm on Wednesdays 12th and 19th December and until 6pm on Saturdays. Santa's Grotto: Booking for Father Christmas online: Once you have booked your chosen timeslot, you will receive a paypal invoice (usually within 48 hours) addressed to the email address you register which is payable as soon as you receive it. If the invoice is not paid, your space is not guaranteed to be held. You only need to book one space, we will know how many children the booking is for by the number stated on the registration form. If you have any questions about the system please feel free to contact us. And Late Nights From 21st November until 19th December between 3.30pm and 7pm (walk ins only). We plant over 20,000 trees each year in different plantations around our farm and take care of them all year round to ensure perfection, this means we will always be able to find you a tree to suit your needs. You can even be taken into one of our plantations to pick your own tree. Goathurst Common Ide Hill, Sevenoaks, TN14 6DA. Phone: 01732 750591. Email: graham_crouch@yahoo.co.uk. Open: Monday to Saturday from 8 am to 5pm; Sunday 10am to 5pm. Directions: Click here for a map and directions. Payment: Cash, Cheque, Debit cards, Visa/MasterCard. We retail to the general public and offer a 'You Pick, We Dig' service in the runup to Christmas. We also have wholesale trees. You Choose and We cut varieties: Blue Spruce. PreCut varieties: Blue Spruce, Nordman Fir, Norway Spruce, and other varieties (call!). Living, rooted tree varieties: Blue Spruce, Nordman Fir, Norway Spruce, and other varieties (call!). Birchwood Road Wilmington, Dartford, DA2 7HD. Phone: 01322 669711. Email: stanhillfarm@googlemail.com. Open: Monday to Saturday, from 9 am to 5;30 pm; Sunday from 10 am to 4 pm, December 1 to December 24. Click here for current open hours, days and dates. Updates: Click here for updates. Directions: For sat nav use DA2 7HD or please see the directions page of our website. Click here for a map and directions. Maize Maze / Corn Maze is open from mid July until end of September; Pumpkin Patch (pre cut) is open from early October until end of October. Payment: Cash, Debit cards, Visa/MasterCard, AmEx. Click here for our Facebook page. Other Pick Your Own crop; Runner Beans We also have a Farm Shop, stocked with a full range of fresh produce, cheeses and preserves. We grow a wide range of fresh produce to supply our farm shop. The Farm Shop is open all year. Seal Chart, Sevenoaks, Kent TN15 0ER. Phone:01732 763123. Email: info@stonepitts.com. Open: Daily, from 9 am to dark. Click here for opening times.Directions: Click here for directions. Stonepitts Farm near Sevenoaks, Kent, has a wide choice of the highest quality Christmas trees in Norway Spruce or Nordman Fir in all sizes ranging from 100cm to 400cm in height, plus tree stands, mistletoe and holly wreaths. The site has easy access and good car parking to make the trip an enjoyable festal experience for the whole family. .
Chelsfield, near Orpington, Kent Phone: 01959 534 308. Open: Saturday 21/11/15 to Saturday 19/12/15; from 10am to 5pm - 7 Days a Week; Late nights Fridays - Open until 7.30pm. Please note that it gets muddy on the farm so it would be a good idea to bring your boots. Payment: cheque or cash. We regret that we are unable to accept card payments. Directions: Situated within easy reach of Jct 4 of the M25, A21 and Orpington Bypass. Local signs marked Christmas tree farm from above roads. South London based suppliers of real Christmas trees. Quailty Christmas trees, weaths and holly displays for the Christmas season. Supplying Christmas trees to the Kent and London areas. 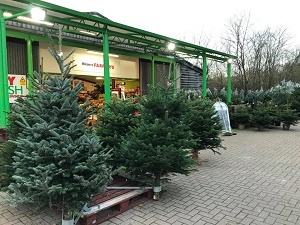 Trees are displayed in the sales area on individual stands helping you select a tree easily with little effort, alternatively many customers choose a tree in the plantation, either reserving for cutting at a later date of your choice or take away freshly cut. If you wish to dig or cut your tree please bring your own tools. South London Christmas Tree Farm also produces natural honey from wild flower and trees on the farm. Click here for details about our honey.